The Man and I did the NaNoReadMo challenge this year: 5 books in 4 weeks between December 15 and January 15. I came in just 60 pages shy of my goal, and it was all because of Never Let Me Go, which, indeed, did not want to let me go, despite my desperately wanting to get away from it. I have a hard time enjoying books where every little mood and glance is described in such excruciating detail. And I’m not a sci-fi connoisseur, by any stretch, but, still, that book could have been edited into an amazing fifty-page short story if you ask me. Anyway, I digress. 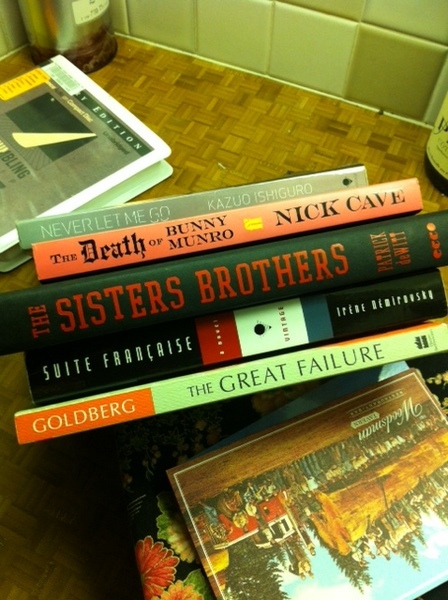 The book I enjoyed most of all these was Nick Cave’s The Death of Bunny Munro. It truly was joyful and masterful. I enjoyed it both as a reader, because the story and character were so compelling, and as a writer, because the pacing and fascination with language were really well done. Way to go, Nick Cave. I love when a book goes all out, takes risks, and actually succeeds. Yea! I also enjoyed Suite Francaise, which is just a mind-blowing document of WWII and the occupation of Paris. Next, I’m putting together my giant list of everything I want to read in 2012. I set a modest goal of 26 books on Goodreads. We’ll see if I can manage it. I’ve signed up again this year for NaNoWriMo, National Novel Writing Month. This is a crazy “competition” to write a 50,000-word novel during the month of November. I “won” in 2007. It’s really a competition against yourself, and for bragging rights. Anyway, that experience, actually, is why I started this blog. I had planned to work on my novel about a musician, but when I started writing, all I was churning out was stuff about food. At the end of that November, A Foodie’s Fall from Grace was born. This year I’m not sure yet what I’ll write about. I’d love to work on my novel about the musician, but if that doesn’t happen, that’s fine too. My other idea is to write 15 short stories, which would work out to a story every other day. We’ll see what happens. I’m trying to be flexible and let the magic of NaNoWriMo do its work. It is a thrilling, wild ride to write 50,000 words in one month, that’s for sure. Lots of writing in my car during lunch breaks at work. In the meantime, I’ve been trying to write a bunch of blog posts in advance so that I’ll be able to keep this blog active while I’m in the middle of the NaNo insanity.